Hey guys! LC8 entry here! Enjoy! 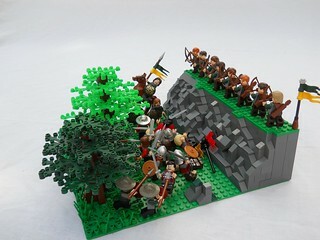 And welcome home to our war-weary Lenfel soldiers! Upon his return from the war, Sir Caelan Munro is summoned to see Duke Cartney of Durrough. Last edited by Caelan on Sun Jun 23, 2013 2:09 am, edited 1 time in total. Another "free build" for the month of June. 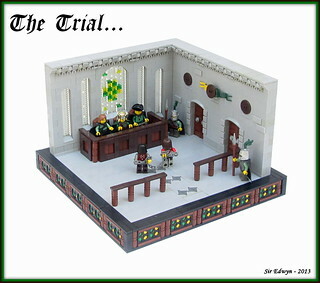 But this one will not be worth any points as I have already submitted 2 other MOCs this month. It is however, my final installment of the collaborative series that the most gracious Mitah val Karem and I have been working on! 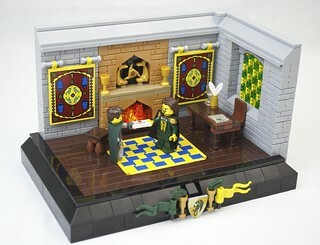 As per the norm, the link to the build in my photostream is embedded in the picture, where you can read the story and see larger/different views. I can't thank Mitah enough for doing this with me, and I'm truly honored by his participation! On a side note, I am just now beginning to work on my LC8 entry. Hopefully I'll get it up before the deadline! Hey guys, here's my entry for LC8: Welcome News! Late in as usual. Story will be up later today. 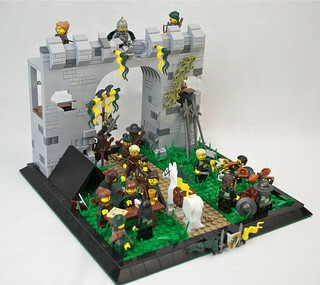 Best of luck, Lenfels, and great work with all those entries and free builds we're seeing these days! EDIT: Story's up now as well. As always, the story can be read on flickr (it is the "meat" of this build, so I definitely recommend reading it), and the link to it in my flickrstream is embedded in the picture. A few comments about my build: When I read the rules and idea behind this local challenge, what Frisky said about focusing less on technique and more of "the feel" of the build really got my attention. I saw several of my fellow Lenfels build "happier" homecomings for their figs (and I have to say there were some stellar entries! ), but I wanted to take a different angle at this. If you'll forgive my poor analogy, I wanted to paint a picture of the aftermath of war. My aim was to show that even in victory, there is death, which is the true definition of a loss. 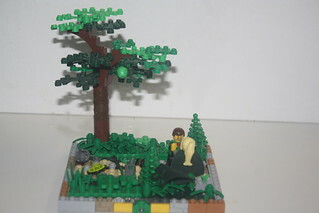 I hope that my MOC conveyed this, and wish everyone good luck in the contest. The Deadline for the LC8 has officially passed, no more entries will be accepted. This has been a very successful LC, with a whopping 10 entries submitted within the two week period. Great job guys! The winners will be announced tomorrow afternoon along with LC9 so stay tuned! EDIT: The entries have been judged based on the criteria. Unfortunately we had to instantly eliminate several builds that although were amazing, did not fit the challenge well enough. Don't worry, you will still receive points for entering. Now without further ado, here are the winners! The Honorable mention for an additional 3 points is Anderad of Lenfald! The Winner for an additional 5 points is Socckerkid6! Congratulations to the Winners! Scores have been updated and the LC9 will be announced later today. Congratulations Soccerkid! I have to say your build was definitely the most deserving as it had the perfect mix of build quality and overall feel. Huge thanks to Friskywhisker for hosting this contest, and to the judges as well. Can't wait to see the next LC! 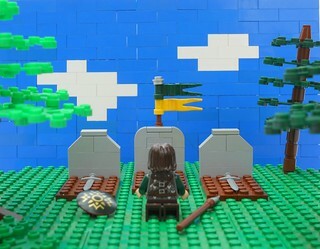 Congrats to Andared and everyone else who entered, there were lots of great builds this LC.